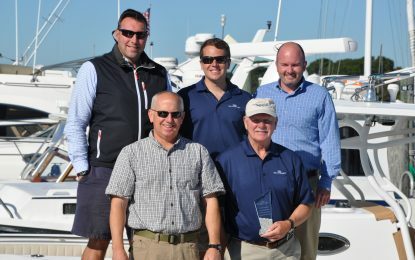 Southport Boats this week announced the recipient of their Dealer of the Year Award. The 2017 award went to Crosby Yacht Yard, Inc. (Crosby Yacht) of Osterville, Massachusetts. This is the first time Crosby Yacht has received the award from Southport. After joining the Southport Dealer Network in 2013, Gregory Egan and Crosby Yacht experienced steady year-over-year gains in annual sales, and had a truly break-out year in 2017 when they doubled their units from 2016. Along with co-dealer Smith Yacht Sales of Hingham, Massachusetts, Crosby Yacht accounted for over 25% of the Southport annual production run. Crosby Yacht and Smith Yacht Sales will look to continue their success in 2018, starting with the New England Boat Show in Boston, February 10th through 18th. About Crosby Yacht Yard, Inc.
Crosby Yacht Yard, Inc, located on Cape Cod in Osterville Massachusetts is a full service yacht building and repair facility. Established in 1850 the company has a long and continued history of providing high quality water front services to the recreational marine sector. Services including vessel sales, hauling, dockage, repairs, restorations, moorings, fuel and full marina offerings. Custom designers and builders of the Wianno Senior sailboat, 24’ Crosby Striper, Crosby Passenger Launch and their line of TUGS.